Flyer from “The 2014 Midwest Membrane Trafficking and Signaling Symposium”, co-organized by Adriana Bankston, Jacob Adler and Dana Watt. The symposium took place at the University of Louisville in Louisville, KY on October 3, 2014. Decide on the symposium topic. The topic could be a research topic you want to learn more about, or one that is close to your own research; it could also be a career symposium, a symposium on teaching, or on whatever else you think might be of interest to your local community of students, postdocs, and faculty. The general idea is to bring together a group of people with common interests who can come away from the meeting having learned something new, as well as having made new connections, and possibly established collaborations. Pick a symposium name. The name should be something broad enough to give you room to plan various smaller sessions under it. Since the ASCB symposium is typically a local symposium, the symposium name often includes the name of the region where it is held. 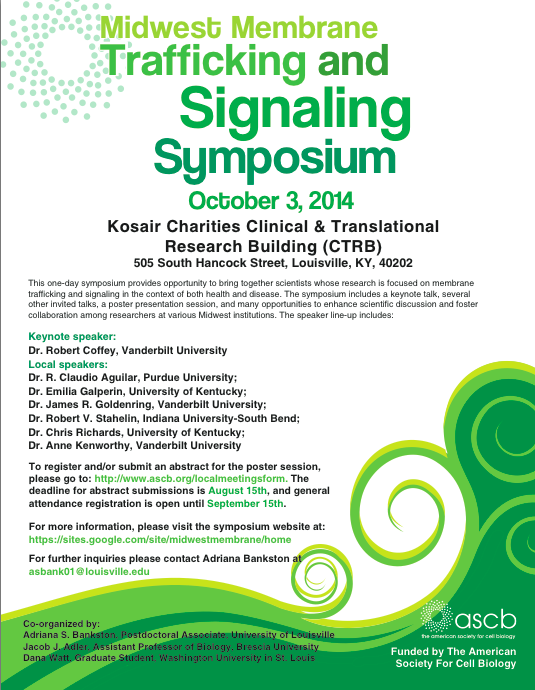 One example of such a name is The Midwest Membrane Trafficking and Signaling Symposium. Other very creative names or acronyms (such as METRAPOLIS, BATS, etc.) can also be found among previously ASCB-funded meetings. Consider your budget. ASCB will give you up to $1,500 to spend according to specific instructions. Generally you should spend the money on essentials, which include: speaker travel, speaker accommodations, catering, tables and chairs for lunch and coffee breaks, poster boards and other poster supplies, water bottles and name tags. Obtain additional sponsors. More money is often necessary to pay for extra items during the symposium. For instance, additional funds would allow you to take your keynote speaker to dinner, offer transportation and/or accommodations for additional speakers, provide parking passes for out-of-town speakers, and give poster and talk awards to students and postdocs. Ideas for where to obtain additional funds include your own university (the Office of Student and Postdoctoral Studies or various research departments). In addition, attending local vendor shows at your university would allow you to secure sponsors who are likely to contribute to your symposium in the future. In the end, you may end up needing a total budget of $3,000, or more, depending on the cost of catering and speaker travel in your area. A reasonable amount of money to ask for is generally $250-$500 from your university, and $250 from vendors. In exchange for sponsorship, offer the vendors a booth to display their products during the symposium. Decide on major speakers. Given the limited budget for a local symposium, most speakers should be located at institutes within driving distance. You will probably only have enough money to fly in your keynote speaker, but if they can drive, that’s a plus. The speakers also need to be doing research or working in areas that are both interesting to a large audience and relevant to the symposium topic. Invited speakers can be scientists whose talk you heard at a meeting, met during job interviews, or whose work you find interesting (browse websites of universities in close proximity to yours). Organizing the symposium can be a great opportunity for you to reconnect with a faculty member whom you already know, or to make new contacts within your field of research. Keep in mind that famous scientists are often very busy, so if you want to recruit a really good keynote speaker, approach them several months in advance. Give the keynote speaker a choice of a symposium date. Give students, postdocs, and junior faculty a chance to shine. Local symposia typically include a poster session, which gives students and postdocs a chance to present their work in front of experts in their field, just as they would at a small national or international meeting. If time permits, include a few selected student and postdoc talks, which will also allow them to hone their public speaking skills. It is also a good idea to give junior faculty a chance to talk about their work, to help them make local connections with other scientists in their field while they are developing their own research. In the end, students, postdocs, and junior faculty will appreciate the opportunity to present their work in front of experts in their field, as well as the fact that they don’t have to travel too far to do it. Decide on a schedule and draft a program. While symposium schedules are typically pretty standard (talks, coffee breaks, lunch etc. ), putting this together will require some juggling depending on people’s schedules— people may need to leave early or join the symposium later that day. To avoid the schedule from becoming too busy, having coffee breaks after every 2-3 talks is a good idea. Another tip is to schedule a really interesting speaker (the external keynote) in the beginning of the day, and another really good speaker (the local keynote) at the end to keep people interested throughout the day. The day typically runs from 8 am until 5 pm, with breakfast and coffee breaks in the morning, various talks during the day, a lunch and poster session in the middle of the day, coffee breaks in the afternoon, and a possible reception at the end of the day. The program you put together should contain the schedule for the day, speaker biographies (optional but nice to have), poster abstracts and assigned poster numbers, information on the poster setup and takedown times, links to campus maps and directions, and a list of attendees with contact information. Use local connections. Local connections are essential for making the symposium a success. Such help typically comes from administrative staff, often willing to manage your budget, as well as perform the necessary local ordering (food, water bottles, etc.). It is also very helpful to solicit the help of someone who has previously organized a one-day local symposium at your university (albeit on a different topic) for help with the logistics of securing speaker travel and accommodations, booking meeting rooms, setting up tables and chairs, and setting up poster boards. Be organized and follow up. Being organized is imperative in order to keep track of everything that needs to be done before, during, and after the symposium day. It is a good idea to set up a timeline of things to do one year, six months, three months, one week, and one day in advance, as well as on the day of the symposium. This will make it more likely that those things are actually being done at those times. Other important items include: confirming all orders several days prior to the symposium (catering, poster boards, etc.) and keeping receipts for everything to turn in to ASCB at the completion of the symposium. Make sure everyone knows what to do. Distribute the program to everyone participating in the symposium early enough (at least one week ahead). On the day of the symposium, put up signs on various entrances telling people where to enter the building and how to get to the registration table—especially important for out-of-town attendees. Also, ensure that the speakers know when and where to give their talks, how long their talks should be, and what the AV capabilities are in the room where you plan to hold the symposium. Inform the poster presenters of their assigned poster numbers, as well as the poster set-up and takedown times. Let the caterer know when and where to deliver which food. Finally, double check that the vendors know when and where to setup their products, and also that the tables, chairs and poster boards are delivered to the right place. Recruit volunteers. Local volunteers are great for helping at the registration table, staffing the ASCB table, cleaning up food during breaks, and taking photos during the symposium day. Volunteers are likely to be students and postdocs from your university. Include the volunteers in your final head count, and attract them with the opportunity to attend great talks and get free food in exchange for their time. Advertising is crucial for a successful symposium. ASCB will assist you in making a beautiful flyer with its logo, and any information that you request on the flyer (or you can make your own). Important information to include on the flyer includes: the name, date, and location of the symposium, a short paragraph describing the symposium, a list of all the speakers if available, links to the symposium registration and abstract submission sites with deadlines, as well as contact information for the co-organizers. Once the flyer is finished, put up flyers in high traffic areas at both your university and other closely related universities. You can also add your event to university calendars, and take advantage of social media. ASCB will also advertise to its members nearby. Design a symposium website. Designing a symposium website is a great way to keep all the necessary information together, and easily distribute it to everyone. The website will also serve as a permanent record for your symposium, which will be useful advertising for future symposia. Examples of such websites are Midwest Membrane Trafficking and Signaling Symposium and the Membrane Trafficking and Polarity Interest Symposium. The ASCB will also set up a link in their calendar specific for your meeting. You can use this site as your only site if you do not wish to create your own. The ASCB can also set up a registration and abstract submission site, if requested. Set a deadline for registration and abstracts, and keep a final headcount. Setting a deadline for registration and abstracts allows you to keep track of the number of people who will participate in the symposium, as well as keep things organized while planning the symposium. Given your limited budget, this will also allow you to have an estimated headcount for catering purposes, as well as for the number of poster boards, tables, and chairs to order. Finally, this also limits people from registering at a later date. However, be flexible because some people might register locally on the day of the symposium—you will need to allow for a few extra people in your headcount. The easiest way to keep a headcount of all the registrants is by having a sign-in sheet at the registration table, which will also be useful information for future symposia. Dividing up duties between yourself and your co-organizers throughout the planning of the symposium, as well as on the day of the symposium, will save you a lot of headaches. You can be the one in charge of organizing all the local details, while the other co-organizers can take care of details that can be done via computer or phone from farther away. This division of labor will make your job easier and teach you how to divide up tasks and work together. Thank everyone and obtain feedback. Make sure to thank the speakers and poster presenters, vendors, volunteers, and all the attendees at the beginning and the end of the symposium, both in person and with a follow-up e-mail. Let them know that they have all contributed something valuable to your symposium, and the symposium would not have been a success without each of them. Ask people to provide informal feedback following the symposium, to help with suggestions and offer ways to improve the symposium in the future. Organizing a local symposium can be a very rewarding experience. The preparation leading to the symposium day will teach you to plan ahead, get things done in a timely manner, divide tasks between the co-organizers, and juggle many other small details. During the symposium day, having a room full of people come from near and far to hear what you have to say and dedicate their whole day to your symposium is an amazing feeling. It is wonderful to think that something that was once just an idea turned into a full-day symposium, during which people can learn from one another, network, and have fun! Overall, organizing a local symposium and seeing it come to completion will be a difficult task, but it will allow you a great deal of personal growth. Plus, doing it right the first time around will make it all that much easier to organize the symposium again if given the chance in the future. If you need more tips on organizing a local meeting, a useful resource from another ASCB-funded local symposium, organized by topic, can be found here. Adriana Bankston is a member of the Board of Directors at Future of Research (FoR), a nonprofit organization with a mission to champion, engage, and empower early career scientists with evidence-based resources to improve the scientific research endeavor. Her goals are to promote science policy and advocacy for junior scientists, and to gather and present data on various issues in the current scientific system. She can be reached via LinkedIn (http://linkedin.com/in/adrianabankston) or on Twitter (@AdrianaBankston).